It is essential for everyday life to remember not only the spatial relationships in our environment (‘My GP’s office is 500 metres south of the new fast food restaurant’), but also the temporal relationship between events (‘I got food poisoning after I had lunch at the new fast food restaurant’). In our new study, published in eLife, we show that remembering both kinds of information relies on similar neural mechanisms. Spatial and temporal relationships are usually not independent of one another: If something is further away, it also takes longer to get there. Previous studies have shown that a brain region called the hippocampus is involved in both memory for spatial layouts as well as for temporal relationships, however, few studies have investigated the two dimensions simultaneously. 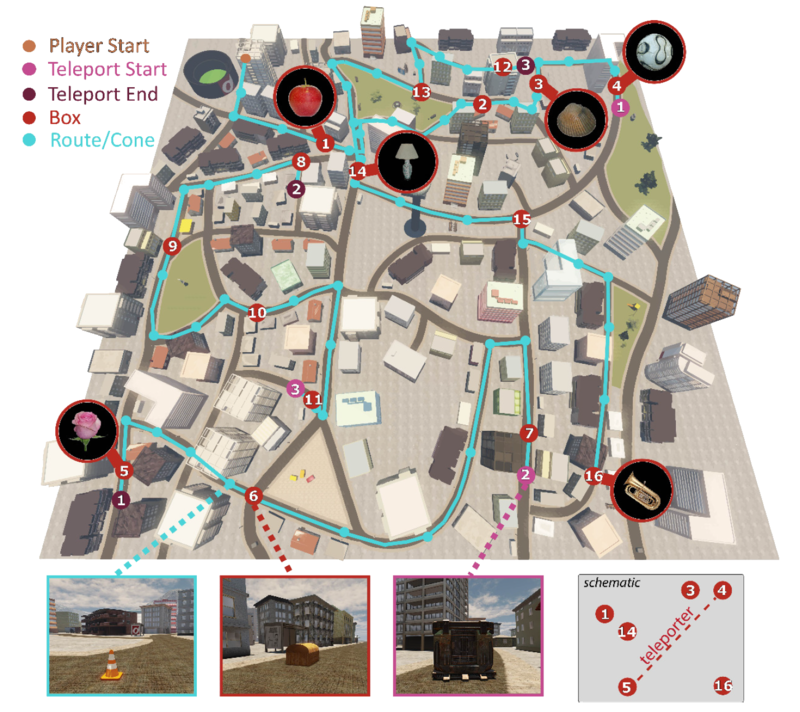 To investigate memory for time and space separately in the same experiment, we let participants navigate through a computer game-like virtual city (‘Donderstown’) in which they picked up different objects along a pre-defined route. Over time, participants learned which object was encountered where and when. Crucially, at certain points along the route, participants had to use teleporters, which immediately ‘beamed’ them to a different part of the city. This way, certain objects along the route could be very far apart in space, but be encountered closely after one another in time. Using fMRI, we then monitored brain activity while participants watched these objects and examined which impact the newly learned spatial and temporal relationships between them had on the hippocampus. Interestingly, we found that – compared to a baseline scan before the virtual navigation – neural patterns in the hippocampus got more similar for objects which were remembered as closer together. This was true for both the spatial closeness, and for the temporal closeness between objects. Moreover, the effect was most pronounced when items were both spatially and temporally close. Participants collected objects while navigating on different routes within a virtual city (shown from birds-eye view). Some parts of the city were connected via ‘beaming’-teleporters, transporting participants over long distances instantaneously. This way, objects that were far away in space could be encountered very closely in time. Using fMRI, we found that both temporal and spatial relationships change memory related brain patterns. These findings lead us to believe that neural patterns in the hippocampus reflect a code for representing the relatedness of items or events – possibly along more dimensions than time and space. We propose that the hippocampus contains information of the inter-relatedness between different objects along many different dimensions in the form of an ‘event map’. In the future, it will be exciting to identify other domains which are represented in this way, such as degree of sympathy or emotionality of items. Eventually, this could help us to improve our understanding of neural mechanisms in psychiatric conditions, for example by investigating whether patients suffering from Major Depression might have a ‘skewed’ emotional event map.